Not long ago I met up with Sophie New and Daniel Belasco Rogers of plan b to speak about their mapping practice that they have occupied themselves with for some years now. Daniel started to use GPS in order to record his life – or better where his life led him – in 2003 after he had moved from the UK to Berlin, Germany. Over the course of time these GPS recordings became not only a daily routine but grew to a valuable stock of long-time data. His partner Sophie joined him in 2007 when she had given birth to their child and her pace and radius changed quite a lot through the use of the pram and later when adjusting to the reduced speed of the little explorer at her hand. The visual results of this practice are fragile looking GPS drawings that continue to grow layer after layer. Since the early 2000s, when artists slowly got aware of GPS technology, it has become a useful medium to trace mobility for artistic purposes, see for instance Trampoline's Tracing Mobility symposium. Together with other technologies that meanwhile have become ubiquitous – like social networks, smart phones, blogs – GPS gave push to an outburst of 'i-culture' which maybe can be described best as: Folks, look where I am, what I do, what I think and feel. To some degree, this self-monitoring and publishing practice has lost its innocence since this information can turn into a saleable commodity or helps to provide proof of your where-abouts to people suspecting you to be a criminal or terrorist even. In the art world, Hasan Elahi became well know for this practice that he developed out of pure necessity and turned into an on-going net art and installation project. Today's obsessiveness with which people twitter and facebook about the most personal and unspectacular events in their life is obviously born of the desire to be heard and seen rather than to be traceable. 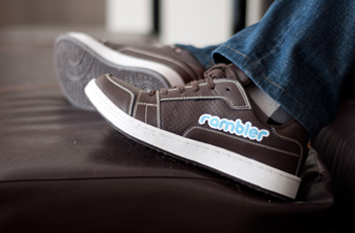 The absurdity of this activity lately condensed in the project Rambler that comes in the form of a pair of sneakers and takes microblogging one step further, by literally posting your steps on a Twitter account. The automatic, thoughtless act of diffusing large amounts of slightly ambiguous, repetitive and arguably useless personal information is the ultimate response to all self-obsessed behaviour on the screen and data collecting efforts behind the screen. With all these technological possibilities of self-surveillance one may wonder which technologies Erkki Kurenniemi, pioneer of electronic music and art would use today in his obsessive, even manic, effort to record his own life since the 70ies, preserving all his thoughts and observations, trivial objects, and a constant stream of images and personal atlas of sounds. When he was portrayed in 2002 in the movie „The future is not what it used to be“ by Mika Taanila, he could not foresee all the services and tools which would make his personal data collection so much easier. In fact he would have been the ideal candidate for using the your.flowingdata application that is one of the earliest examples of visualising and interpreting your own on-line activity. Even if Kurenniemi eventually fails in his attempt to reach immortality by being recreated as a “virtual persona” in 2048 as a merging of man and machine, his vast archive of personal data may at least feed data sculptures such as A week in the Life by Andreas Nicolas Fischer, representing his movement and communication made with his cell phone in one week.